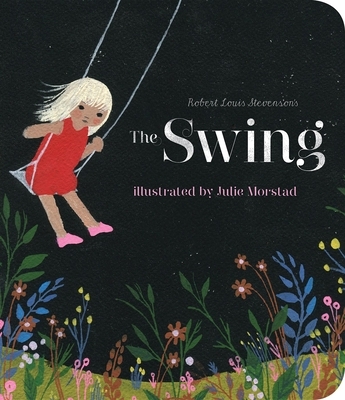 Delightful images by Julie Morstad bring to life Robert Louis Stevensons classic poem, The Swing. The poem depicts the joy of playing on a swing, enjoying the countryside around that is fleetingly glimpsed as the swings soars through the air. Morstads delightful drawings capture the innocence of childhood and the delight in play. Babies and toddlers will adore reliving the joyous feeling of flying on a swing. Robert Louis Stevenson (1850-94), was a Scottish novelist, essayist and poet who contributed several classics to the world of children's literature. He is best known for "A Children's Garden of Verses," "Treasure Island," "The Strange Case of Dr. Jekyll and Mr. Hyde," and "Kidnapped." Julie Morstad is an award-winning illustrator and fine artist known for her surreal, whimsical work. Illustrator of numerous children's books, including "Singing Away the Dark" and "When You Were Small" and its two sequels "Where You Came From" and "When I Was Small," Julie has exhibited her work in galleries, animated two music videos with her brother, filled up stacks of sketchbooks, and made countless pots of soup and many loaves of bread. She lives in Vancouver with her family. Ever curious Henry, whose enquiries about the recent past formed the basis of Sara O’Leary and Julie Morstad’s previous collaborations, When You Were Small and Where You Came From, has another question for his mother, this time asking her for a story about when she was small. Henry’s mother answers with a series of very short, beautifully bizarre anecdotes delivered at the pace of one per page. The book takes the idea of Henry’s mother being “small” literally – she is pictured skipping rope with a ball of yarn, swimming in a birdbath, and standing on a spool of thread. The dreamy quality of both text and image gives the book a slightly low-energy feel, but it may be the perfect thing for a kid who is just a little quiet, a little shy, but still inquisitive – a child not unlike Henry. The result is a perfect antidote for parents whose retinas have been scorched by too much Dora the Explorer. Small visual details, such as the frequent hand-lettering and the spot illustrations, add to the book’s quiet impact. The framing of the narrative, with Henry’s question at the beginning and his mother’s comments at the end, gives kids something concrete to hang onto throughout. When I Was Small is not only a charming picture book, but by focusing on the parent’s past instead of the child’s, it also has the potential to be a great conversation starter. Finalist for the 2011 Marilyn Baillie Award, Canadian Children's Book Centre!